The Amiga 1000 also has an additional 256 KB but this is usually reserved for Kickstart and not normally available for programs. The Amiga 2000 Rev. 4.0 have 512 KB chip RAM on the motherboard and 512 KB Fast RAM on an expansion card fitted to the 86-pin CPU slot. Amiga 2500 models have Amiga 2000 motherboard with A2620 (in Amiga 2500/20) or A2630 (in Amiga 2500/30) processor board fitted into the 86-pin CPU slot. The 68000 CPU is on the motherboard and 68020 or 68030 CPU is on the processor board. 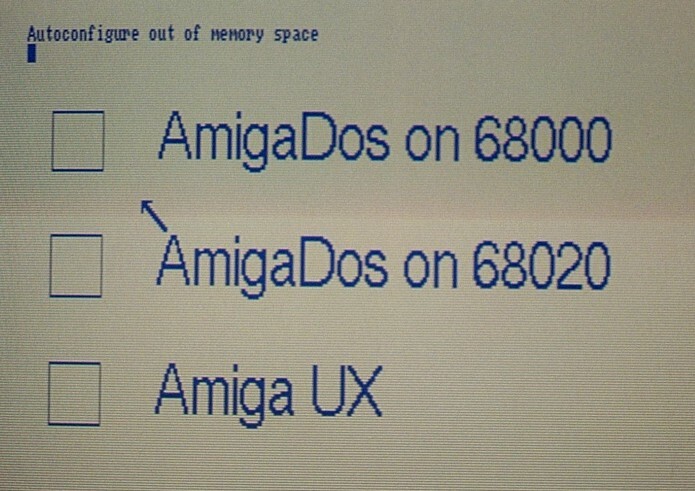 If you choose AmigaDOS on 68000, the accelerator card is disabled, FPU; MMU and 32-bit Fast RAM of the processor board is not accessible, and the system runs as a standard A2000 with hard drive. If you choose Amiga UX or AMIX, a UNIX operating system is invoked (provided you have the proper hardware/software installed). Amiga UNIX run only 32-bit mode (cannot run in 68000 mode). Kickstart/Workbench 1.4 was a beta version of the upcoming 2.0 update and never released, but the Kickstart part was shipped in very small quantities with early Amiga 3000 computers, where it is often referred to as the "Superkickstart ROM". In these machines it is only used to bootstrap the machine and load the Kickstart that will be used to actually boot the system. The appearance is similar to that of 2.0 and higher, with just minor differences. It is, however, possible to dump out of the OS selection screen by clicking where one would expect to see a close gadget. This will cause the machine to boot Kickstart 1.4 using either the wb_2.x: partition, or from a floppy. If you hold down both mouse buttons after you switch on the A3000 you will be prompted to choose the operating system version to use. You can either bootstrap Kickstart 2.x and Kickstart 1.3 from hard disk or from floppy disk. If you don't hold down any mouse buttons the boot ROMs will bootstrap the Kickstart from hard disk, using the partition with the highest boot priority. Normally, this is the Kickstart 2.x boot partition. The hard disk partitions must be named "WB_2.x" and "WB_1.3" (note: these are devices names like "DF0", *not* volume names) and the Kickstart files must be in "WB_2.x:devs/kickstart" and "WB_1.3:devs/kickstart". The partitions must be formatted either in standard filing system or fast filing system format. You *cannot* bootstrap from hard disk drives that are formatted with the international flavours of these filing systems or with the directory caching filing system. When you make the choice to bootstrap the operating system from hard disk, the Kickstart bonus code will disable the "other" boot partition, i.e. if you choose Kickstart 2.x the "WB_1.3" partition will be made invisible (and the other way round). If these Kickstart files and partitions are unavailable, you will only have the option to bootstrap from floppy disk. This is the only option you have after you replace the original hard disk drive with a "fresh" drive. Somewhere Agnus 8372A mentioned as simply "8372". Fat Agnus 1MB and Fat Agnus 2MB usually known as Super Agnus; Super Fat Agnus; Fatter Agnus; Big Agnus; Big Fat Agnus; Super Fat Agnus, but these aren't official names.